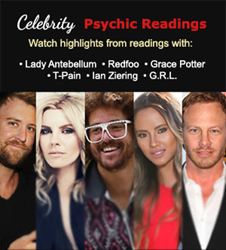 Celebrities Turn to Psychics for Answers… and We Caught it on Video! A group of major celebrities has assisted in the effort to bring quality psychic services to the mainstream in a fun, irreverent yet emotional, video. If you could know your future, would you ask? These celebrities did. T-Pain, Ian Ziering, the guys of Lady Antebellum, Grace Potter, G.R.L, and Redfoo wanted to know more than just their futures. This summer, they asked top Advisors from Psychic Source, the most respected psychic service since 1989, questions about love, career, and even the spirits lurking in their homes. The much anticipated highlight video, Psychic Source Celebrity Readings: Episode 1, has finally launched—and you won’t believe what it reveals! If YOU were famous, what would you ask a psychic?! If Grace Potter were to have an affair, who would it be with? Where is T-Pain’s career headed? How many installments of “Sharknado” will Ian Ziering appear in? Will Lauren of the hot, new girl band G.R.L. have her own clothing line? What’s in store for Dave Haywood and Charles Kelley of Lady Antebellum’s love lives? The video has everyone, from skeptics to die-hard believers, laughing hysterically at the celebs’ reactions to their readings. Watch the official highlight video, Psychic Source Celebrity Readings: Episode 1, on PsychicSource.com (http://www.psychicsource.com). You can also watch some behind-the-scenes footage, including Ian Ziering joking with Psychic Kimberle and Charles Kelley of Lady Antebellum pretending to be a psychic, in the blooper reel!